SEVERE CLEAR: There’s nothing but sunshine across Alabama this afternoon; temperatures are generally in the 65- to 70-degree range. Tonight will be fair and cool, with a low in the upper 40s for most communities. Tuesday and Wednesday will be warmer; we expect a good supply of sunshine both days with a high close to 80 Tuesday, followed by low 80s Wednesday. During the day Wednesday into Wednesday night, severe storms will likely break out in areas well west of Alabama, from Texas to the Great Lakes, as another vigorous weather system moves out of the western U.S. SEVERE WEATHER THREAT LATE THURSDAY/THURSDAY NIGHT: South winds will increase during the day Thursday as the system to the west approaches, and a band of showers and storms will push into Alabama late in the day. The new global model guidance is slower, suggesting the main window for stronger storms in our state will come from 3 p.m. Thursday until 3 a.m. Friday. The Storm Prediction Center has all of Alabama in a severe weather risk for late Thursday and Thursday night. Thunderstorms during the time frame could produce large hail, damaging winds and a few tornadoes. It’s still too early to really define the magnitude of the event and the placement of the highest risks. 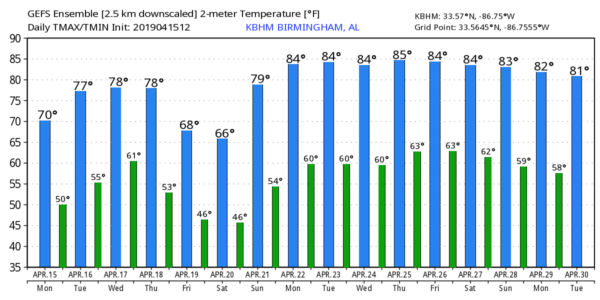 This is April in Alabama, and having events like this are common this time of the year, the core of our spring tornado season. 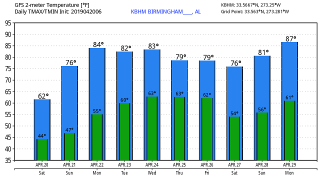 FRIDAY: The severe weather threat shifts east of Alabama Friday; around here the day will be cloudy and much cooler as a deep upper low moves right over the state. We will have the risk of some rain at times; we might even see some small hail from light rain showers because of the very cold air aloft associated with the upper low. Temperatures could very well hold in the 50s all day across the northern half of the state. EASTER WEEKEND: The weekend will be brighter and warmer. We are forecasting a good supply of sunshine Saturday and Sunday with a warming trend; the high will be near 70 Saturday and in the upper 70s Sunday. NEXT WEEK: The first half of the week will be dry; new guidance hints at some chance of showers and storms by Thursday or Friday. Afternoon highs will exceed 80 degrees on most days. ON THIS DATE IN 2011: The “forgotten” tornado outbreak of April 15, 2011, occurred. Throughout the day, 45 tornado warnings and 19 severe thunderstorm warnings were issued for central Alabama. Of 29 confirmed tornadoes, the total damage path length was more than 244 miles, with 10 of those tornadoes having damage paths more than 10 miles long. Four people were killed, including three in a mobile home at Boones Chapel in northern Autauga County. The event was forgotten by many because of what would happen 12 days later, on April 27, 2011, when a generational tornado outbreak would kill 252 people in our state. WEATHER BRAINS: You can listen to our weekly 90-minute show any time on your favorite podcast app. This is the show all about weather featuring many familiar voices, including the meteorologists at ABC 33/40. Rain should be out of the state by late Saturday. Sunday should be a picture-perfect spring day. The next time we have a day this cool will probably come in October.